See a stellar line-up including an ex-champion and an incumbent current champion, plus a host of hungry challengers may make this one of the most exciting Olympia contests in years! This was Ronnie Coleman’s last Olympia as he announced his retirement. Markus Ruhl also announced his retirement. 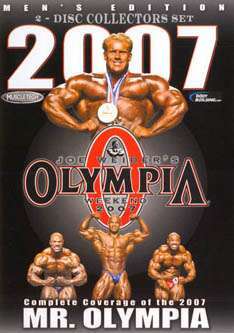 The coverage of the 2007 Mr. Olympia is outstanding. The closeups of the men are awesome. With my 50″ HD television the bodybuilders look like they are actually right in front of me. I could not have a better seat even if I had attended the contest.